Keep the conversation using #PeoplesCup and catch up with Friday night's action here. Watch first-round highlights on the iPlayer from 06:00 GMT on Saturday, 4 March. We've come to the end of the road. Just for tonight that is! We're ending our coverage of day two of the FA People's Cup round one but don't worry we'll be back again at 10:00 GMT on Sunday. In the morning it will be the turn of the Under-14 and Under-16 girls before the Adult Male category in the afternoon. Thanks to everyone for getting involved today. It has been a blast! Right at the end of today's action, we've just got time to congratulate Retro Rovers A on their victory in their Walking Football category. We'll see you in the semi-finals! Keep watching this video until the end. There's a great interview with Jan, who runs Retro Rovers and we have mentioned a few times today. If you want more FA People's Cup action don't miss next weekend's highlights show. It will be presented by BBC Radio 1Xtra's Nick Bright and if you've been competing - or sent us your videos - you may well feature! You can catch it on Saturday 4 March 13:00 GMT on the Red Button . If you miss it, don't worry. You'll be able to catch up on BBC iPlayer . Shirts hanging up ready, the FC Bouncing Boys are well prepared for the start of their FA People's Cup journey! Don't forget we're back tomorrow when over 3,000 (yes 3,000!) Adult Male teams play their first round of games up and down the country. Congratulations to Basildon Soccability Under-16s - winners in their disability section today. Great work and good luck for the regionals! Win the title last year? Check. Vote of no confidence this year? Check. Following 6-0, 6-0, 7-0, 8-0 defeats Boys from Nancy have sacked their manager. You might recognise David, the club's captain. He's a star of TV and stage . Think Doctor Who, Silent Witness, W1A. Video caption: You might recognise the captain of this team from the TV and stage! You might recognise the captain of this team from the TV and stage! Well done to the COWs lads- you deserve to celebrate! Not really living up to your name with this generous tweet! Great effort guys and there's always next year. It's the calm before the storm for Pieter Steketee as he enjoys an afternoon of sightseeing in Newcastle ahead of the big FA People's Cup day tomorrow. Don't stay up too late, Pieter! Nice work from our colleague Tom there. What he has failed to do us send us the previous seven attempts where he slipped, missed and made a right old fool of himself. How to keep yourself entertained whilst waiting for the Walking Football final? Never mind, fellas. You've brought plenty of colour to People's Cup proceedings today. Retro Rovers A have come out on top here against Retro Rovers B in the Doncaster Walking Football final. They're a step closer to Wembley, of course. Video and interviews to follow! Haddenham Rovers Old Boys are celebrating their victory today with a good old-fashioned....water? Keep those results coming to #PeoplesCup ! How has Dave Scotney and his Boston United walking football teams got on this afternoon? They're coming into the People's Cup off the back of a first tournament win in Grantham last week, where one of their teams won all six matches. Have they managed to take that form into their group in Peterborough today? Let us know, Dave! This is Jan Milner who runs the fantastic Retro Rovers teams - both of which have reached the Walking Football final in Doncaster today! 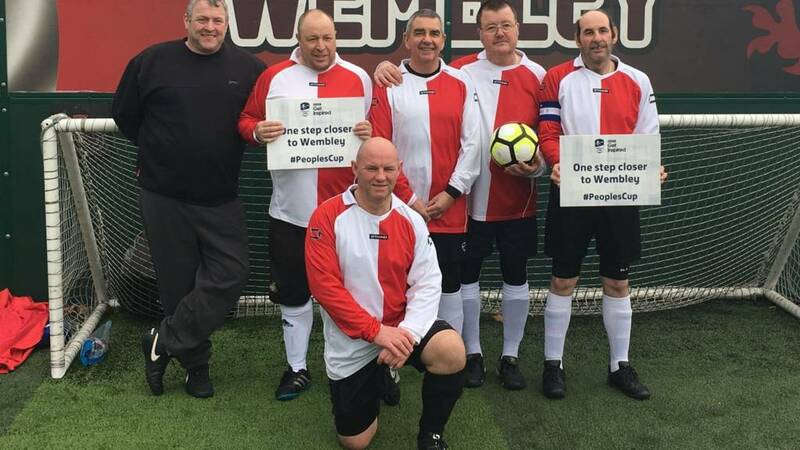 Video caption: "Football is the people's game""Football is the people's game"
Mike Bushell went to meet Jan recently to find out more about how she returned to football after health problems seemed to mean the end of her playing days. It's not all about the winners. The FA People's Cup wouldn't be the nations biggest five-a-side tournament without teams like yours. Big congratulations to Rotherham United Community Sports Trust U16 Disability team , winners in the first round of the FA People's Cup in Sheffield. Keep it going, lads, and good luck in the semi-finals!